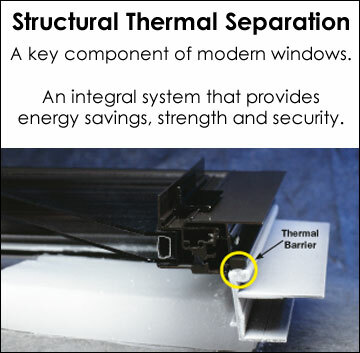 It's All About The Glass | Thermal Windows, Inc.
Design-based criteria ignores the importance of overall window performance. Since most of a typical window is glass, the type and quality of glazing is the most important factor affecting performance. 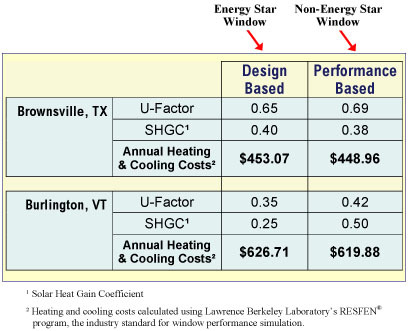 As shown in the table, a Non-ENERGY STAR window that uses insulating glass with proper airspace, low-E and inert gas fill performs as well as or better than an ENERGY STAR window. In both examples, the Non-Energy Star window actually saves MORE money than the Energy Star window, even though it does not meet the Energy Star criteria! The Energy Star label can actually encourage the buyer to choose products with inferior performance, especially when water leakage and air infiltration is taken into consideration. American homeowners deserve the freedom to purchase products in a competitive marketplace, not from a list provided by the government. Design-based criteria overemphasizes window frame materials. Performance-based criteria considers the overall performance of the entire window, as well as security, safety and structural integrity. Energy-efficient insulating glass with proper airspace, low-E and inert gas fill can result in windows that meet or surpass ENERGY STAR requirements regardless of the frame materials.